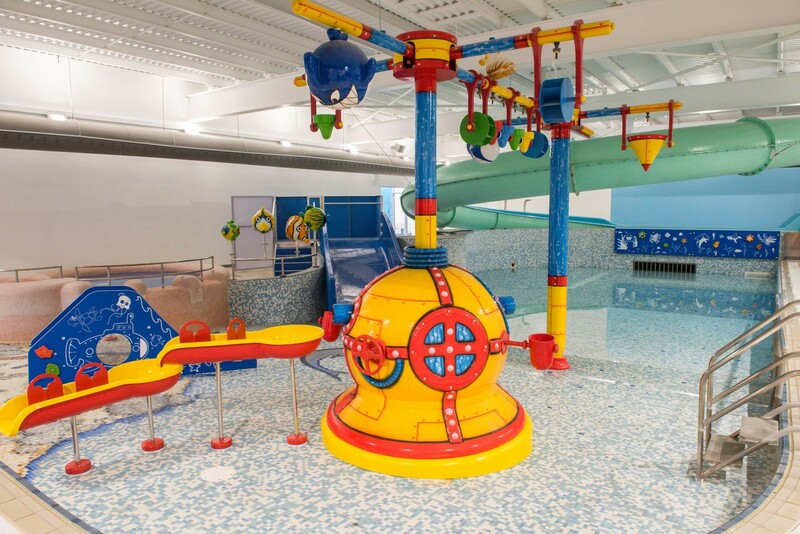 Hippo Leisure worked in collaboration with Cresta Leisure to transform the spectator area at Basingstoke Aquadrome into an ‘Under the Sea Splash and Play Zone’, aimed at increasing the fun appeal for toddlers and young children. 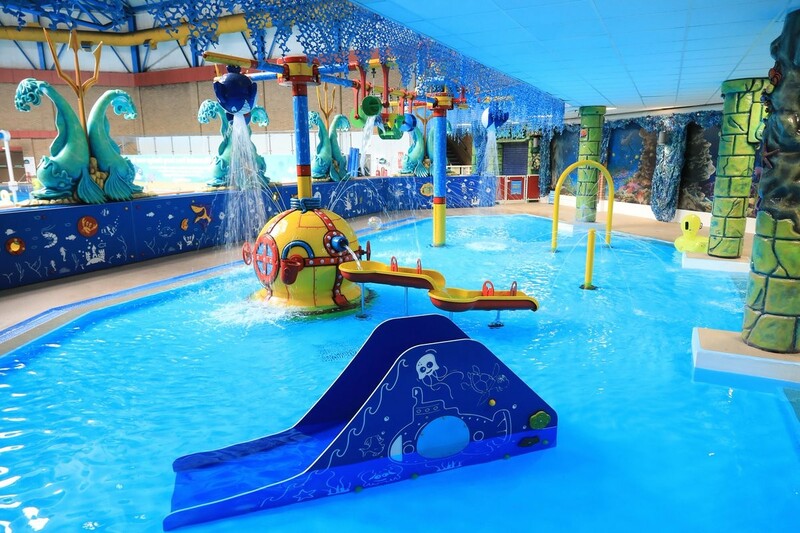 The new children’s pool constructed by Cresta Leisure has been furnished by Hippo Leisure with a range of eye-catching, interactive water play features. 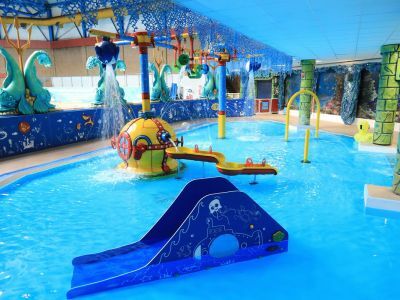 The features are designed to encourage children to learn through play and increase their water confidence as they explore and discover their aquatic environment. through round windows that have an underwater fishy theme. The lights are powered by a low voltage supply. The waterball has a variety of low level water features which are popular with toddlers and less water confident children. These include fill ‘n’ spill buckets, interactive hand wheels and cannon jets. 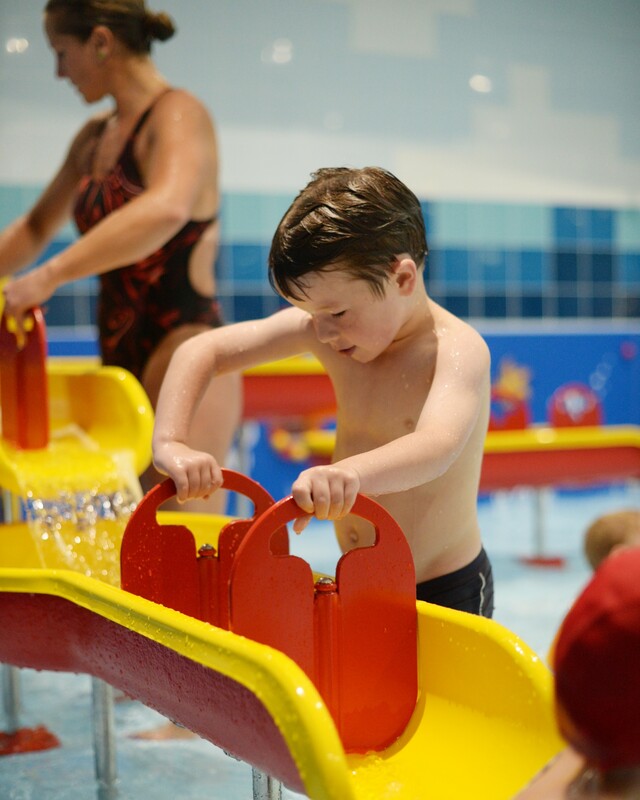 One of the cannon jets feeds two interactive water channels which feature paddles, allowing children to control the water flow through them and let it cascade back into the pool. sequence and splash children playing underneath them. Two waterwheels spray children with water as they constantly spin around. 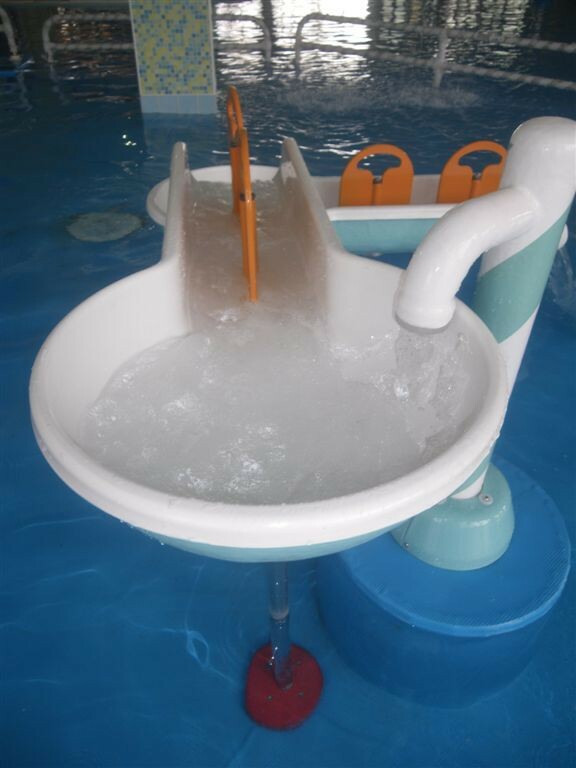 The waterball also has a tipping bucket arm, a shark shower arm and a waterwheel arm which provide extra excitement! Finally, a pelican perched on one of the arms squirts water from its beak into the pool. A variety of fish water squirts create a bright, fun and vibrant visual impact while gently squirting water into the pool. The fish are part of a handrail on the open side of the new pool. Finally, a set of interactive wall panels make up the wall of the water play area. The panels are themed with a bright underwater design and have a selection of moving parts and mirrors which provide tactile, visuals and auditory stimulation. The panels incorporate two sensors and two speakers. When a child presses the sensor, they are given a randomly selected instruction from the speaker to find objects on the panels. The sensors and speakers work independently to allow multiple instructions to be given at the same time, enabling several children to play with the panels together. The panels are perfect for encouraging water confidence. 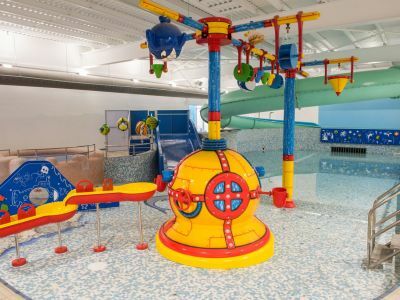 Hazel Tilbury, Chair of the Basingstoke and Deane Community Leisure Trust told The Basingstoke Gazette: “The Trust is proud of its new investments with the new ‘Under the Sea Splash and Play’. 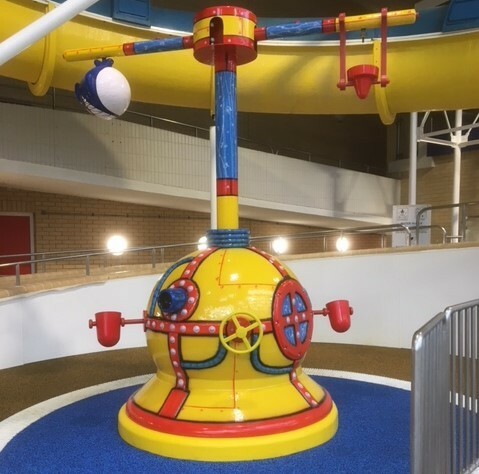 This new water feature is designed to enable younger children to gain confidence in the water whilst enjoying its stimulating and eye-catching design that’s educational, interactive and most importantly, fun. Along with the gym improvements at the Aquadrome we hope visitors and members enjoy using these new facilities”. Cllr Simon Bound, Cabinet member for communities and community safety told The Basingstoke Gazette: “We hope that the ongoing improvements we are making will encourage more families and individuals to make the most of these fantastic local leisure facilities. This is a great example of the council’s commitments to partnership working to improve leisure opportunities across the borough”. variety of high and low-level features allows children to increase their water confidence through play as they explore and discover their aquatic environment. play with a variety of fill ‘n’ spill buckets, handwheels and cannon jets as they control and manipulate the flow of water in various ways. The waterball also has an interactive mast which features three arms, each with a high-level surprise or anticipatory play feature. More water confident children, and even adults will love getting splashed and sprayed by the waterwheel, tipping bucket and shark shower. The mast connects to a second mast via a span pipe. The span pipe holds two small waterwheels, four tipping buckets and a pelican squirt. 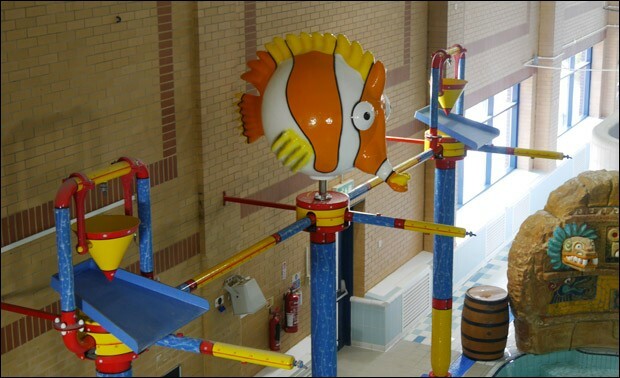 The second mast has replaced an old mushroom fountain and includes three interactive arms which feature a spray rail, large tipping bucket and shark shower. 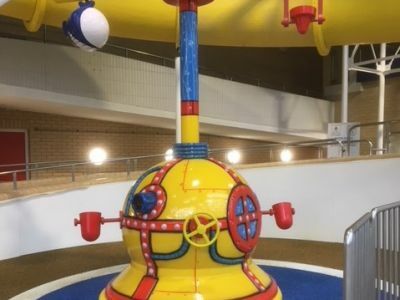 Toddlers will enjoy playing with the two interactive water channels which are filled via one of the cannon jets on the waterball. 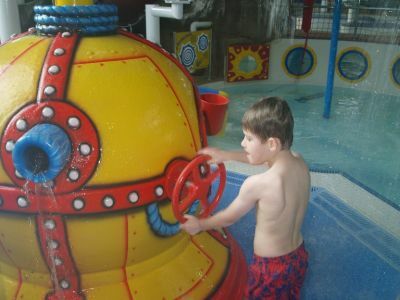 Children can use the paddles on the channels to manipulate the flow of the water through them and back into the pool. Two new slides have been installed. There is a bright and colourful aquatic themed toddler slide which has moving fish and a domed mirror to provide tactile play. 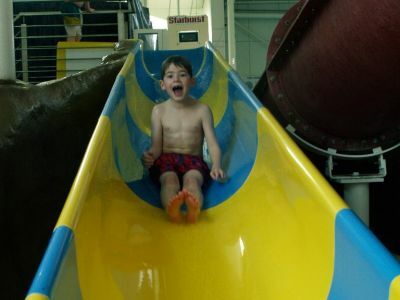 There is also a custom built wide ramp slide which older children will enjoy as they enter the slide at the poolside and splash into the pool on exit. On the poolside there are four large fish squirts of assorted designs and colours which create a bright and vibrant visual impact while gently squirting water onto bathers in the pool. Finally, there are 2 interactive wall panels which feature a colourful underwater design and a large number of moving parts and mirrors to provide tactile, visual and auditory stimulation. One panel is fixed to the wall in the beach area and the other at the deeper end of the pool. Hippo Leisure worked in collaboration with Bath Sports and Leisure Centre to ensure that the play features were installed and ready for children to enjoy over the summer holidays. Hippo's play features are designed to allow easy updates or expansion in the future. This will give Bath Sports and Leisure Centre the opportunity to ensure the pool is kept fresh and appealing to help to maintain high regular visitor numbers in the long-term. Barnaby Rich, General Manager at Bath Sports and Leisure Centre told Somerset Live: “This comprehensive refurbishment programme will allow us to provide outstanding, accessible and affordable facilities for the entire community, to get more people, more active, more often”. 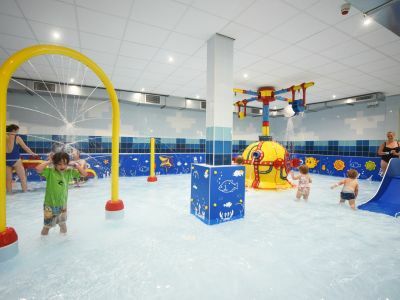 Hippo Leisure collaborated with Alliance Leisure to create a new interactive water play area at Leisure at Cheltenham. Hippo worked with Cresta Leisure who built the new children’s splash pool and Hippo Leisure furnished the pool with water play equipment. This project was just one part of a £2.5million redevelopment programme at the Centre. The new water play area brings a fresh kid appeal to the wet leisure facilities at the centre and encourages regular visits from an increased number of children of all ages and abilities as well as their families. 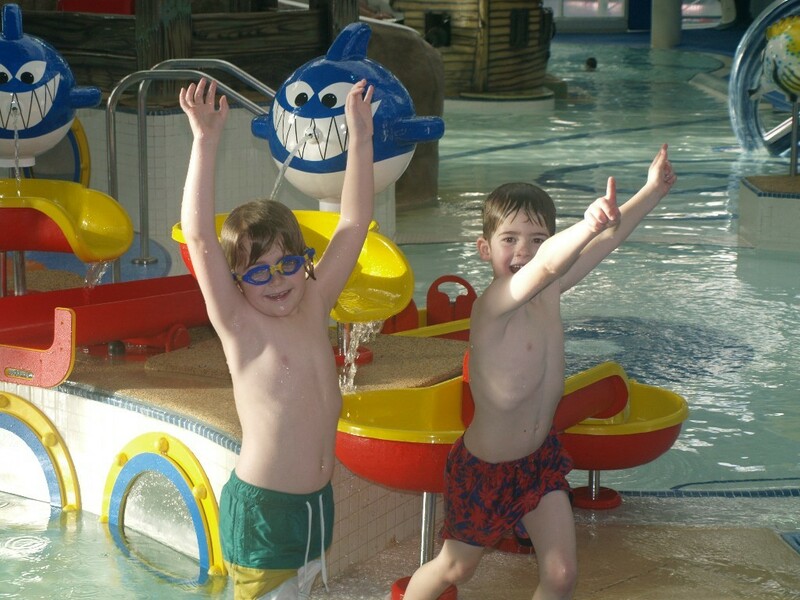 encourage water confidence as they explore and discover their aquatic environment. The 70 square metre splash pool provides fun for up to 32 people at any one time and includes over 50 active water points. the water to the waterball jets, and finally cannon jets which create a gentle flow of water into the pool. 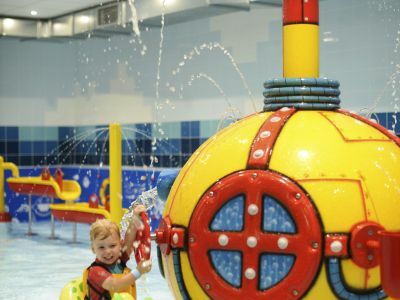 The waterball is topped with an interactive mast which houses 4 themed arms which provides high-level surprise and anticipatory play for older and more water confident children. The arms feature a tipping bucket, shark shower, water wheel and a pipefalls arm. 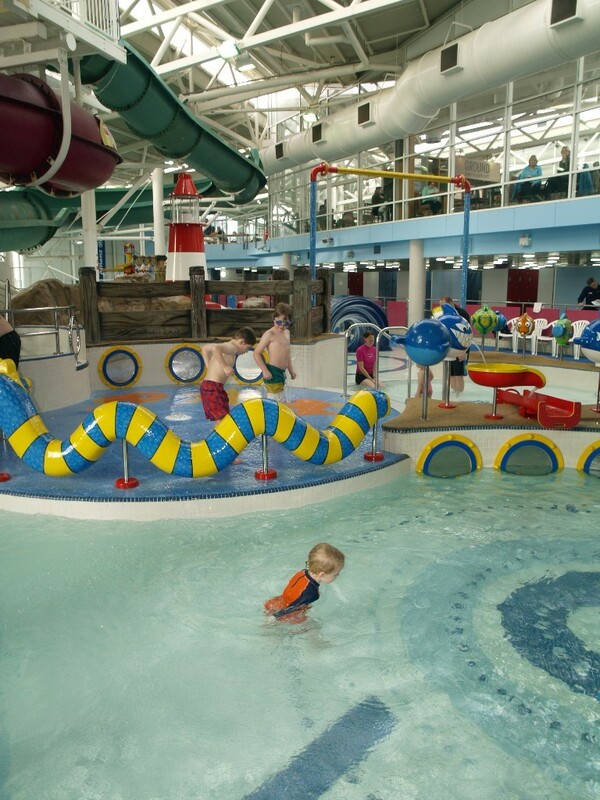 The pool features a wide range of children’s splash toys including a spray hoop and water web. 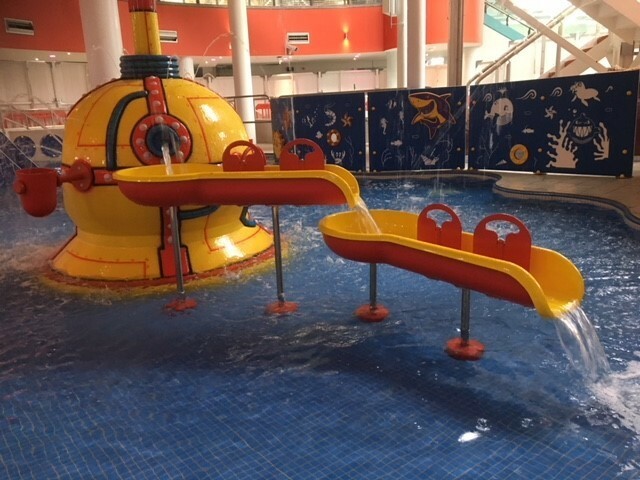 A water cascades feature made up of a short mast and four interactive water channels of varying heights brings excitement to young children as they use the paddles to control the flow of the water passing through them. An under the sea toddler themed slide with a tactile surface, moving fish elements and mirrors brings a fresh and fun element of play to a traditional toddler slide. 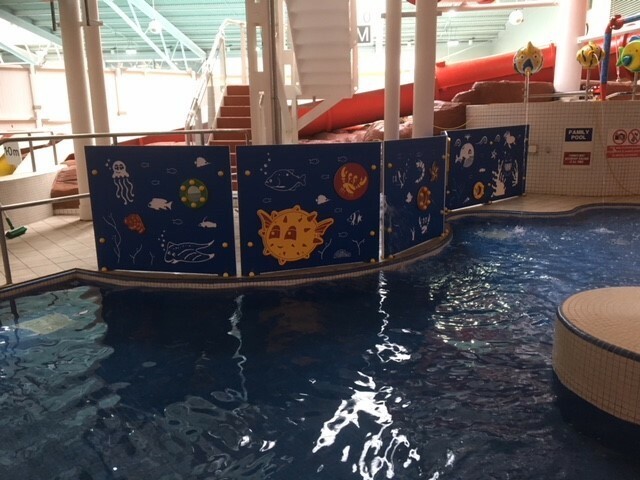 The wall around the splash pool is made up of a selection of underwater themed interactive play panels which include moving parts and mirrors. This helps children to develop their tactile, visual and auditory stimulation. The pool’s central column is also surrounded in interactive play panels for extra interactivity. Hippo Leisure worked hard to ensure that the play features were installed in time for the summer holidays. Julie Finch, chief executive at The CheltenhamTrust told Gloucester Live: “We’re very excited to see the project come to life after a significant amount of planning and hope that it brings a lot of fun and enjoyment. As a not for profit organisation, we can continue to reinvest money back into our sites across Cheltenham, continually improving the customer experience and offering the best in health and fitness space and equipment. The trust is particularly keen to ensure any customers with special needs are properly catered for, which has shaped some of the new features”. Hippo Leisure has transformed the toddler pool at The Metrodome Complex in Barnsley into an interactive parent and toddler zone which has been named ‘Barnacle Bay’. The pool features a water factory and range of splash toys. The bright and colourful play features aim to encourage families to visit the pools regularly and help toddlers and young children of all abilities to develop their water confidence. 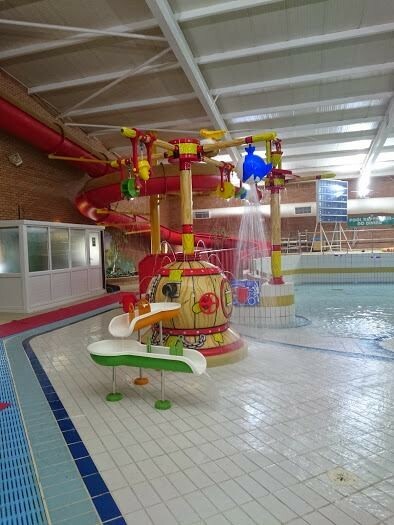 The Hippo play features are just one part of a £500,000 pools upgrade programme at the Complex. 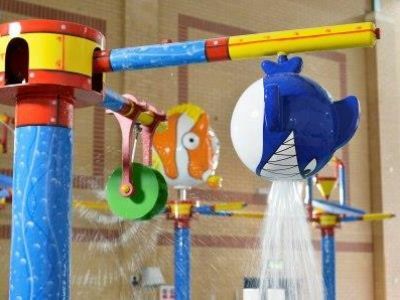 An interactive waterball makes a visually appealing centrepiece and includes a mast with a tipping bucket arm, a waterwheel arm and a shark shower arm. These play features tip and spray water onto children playing below. For less water confident children, the waterball has a range of low-level features including water jets and fill ‘n’ spill buckets which are filled by the water jets before toddlers can tip the water from the buckets back into the pool. 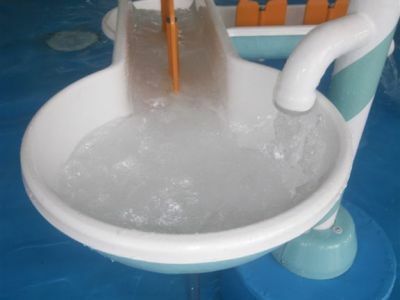 Toddlers also have fun turning two interactive handwheels to control the flow of water to the waterball jets. Two cannon jets create a gentle flow of water into the pool and feed water to an interactive water channel which then cascades to a second water channel. 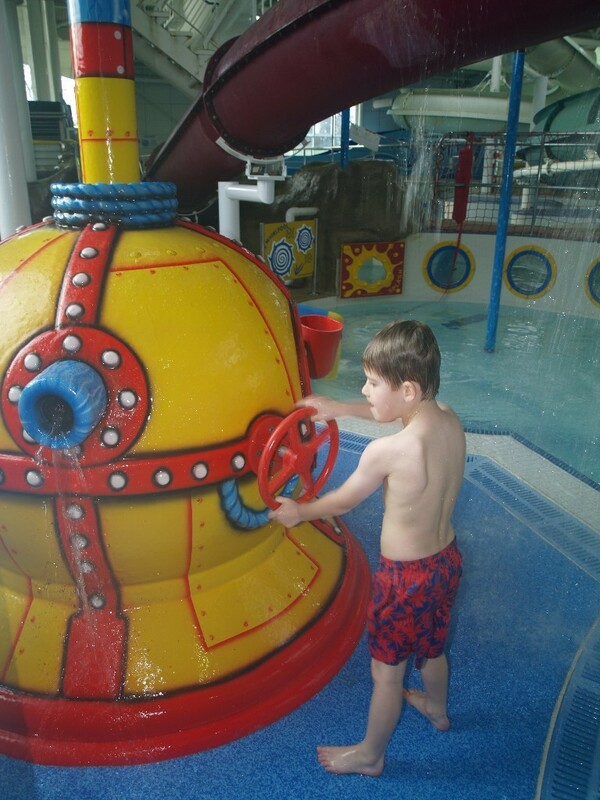 The water channels have paddles which enable children to control the speed and direction of the water flow. A span pipe connects the waterball mast to a second mast and is also the home of a range of high-level surprise and anticipatory features including four tipping buckets, two waterwheels and a resident pelican water squirt which squirts water from its beak into the pool. The mast features three interactive arms: a shark shower, a waterwheel and a pipefalls. 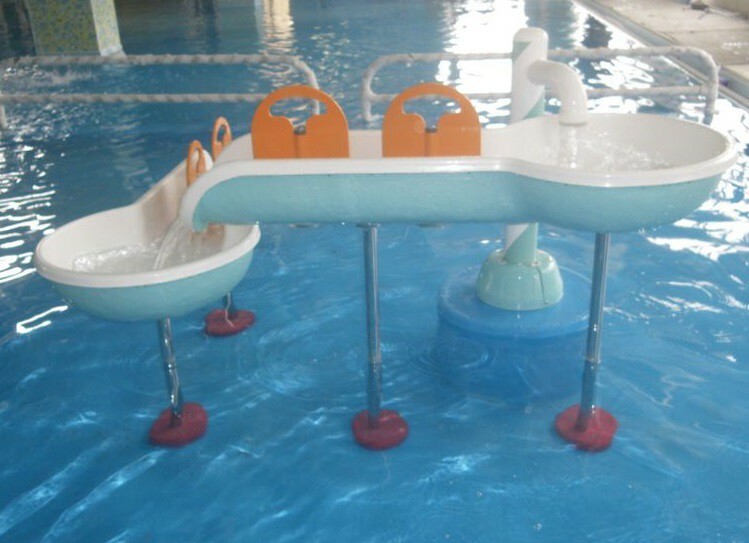 A large tipping bucket and splash board sits on top of the mast and provides a great surprise for children as it fills with water and soaks children below as it tips litres of water into the pool below at regular intervals. 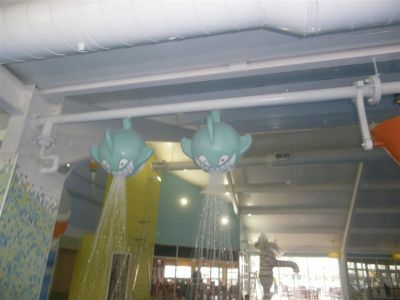 The pool includes a range of splash toys including a spray hoop which encourages children’s water confidence to grow as they are gently showered with a gentle water curtain effect as they pass under it. A colourful water web post jets out water to create a web effect. 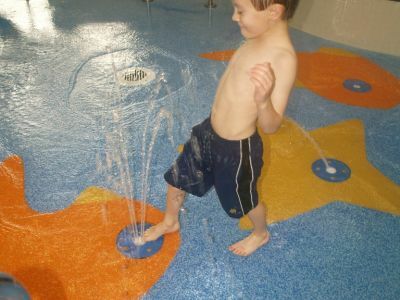 Children can cover up holes on both the water web and the spray hoop to manipulate the flow of the water. 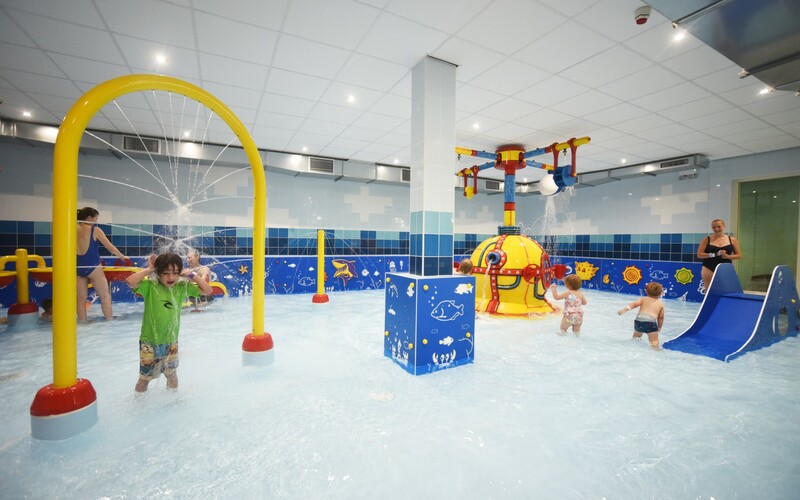 The pool wall is covered in aquatic themed interactive play panels which have a bright and tactile design and feature several games and activities to captivate young minds. Finally, an under the sea themed interactive toddlers slide is popular with toddlers who can play with the spinning fish and see their own reflection in the submarine mirror on the side of the slide as they wait their turn to climb the steps and slide back into the pool. The play features were installed in a timely manner to ensure only minimal disruption to access to the pools at the complex. The installation was completed in time for the summer holidays and has been enjoyed by both local families as well as those on holiday. The water factory has the potential to be easily updated or expanded in the future if required to keep the pool fresh and appealing to visitors. 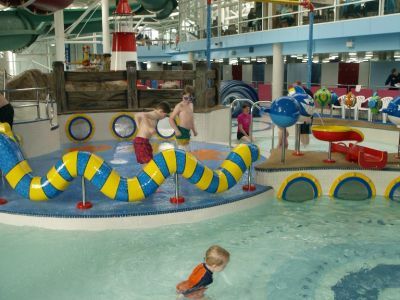 Simon Potter, Manager at Barnsley Metrodome commented to the Barnsley Chronicle: “The addition of a new teaching pool and the creation of a new interactive parent and toddler zone is going to be a major enhancement to our pool offering”. The paddling pool in the Beach Area at The Triangle Leisure Centre in Burgess Hill has been rejuvenated with a new Hippo water factory. This project is one part of a £600,000 improvement programme at the centre. The toddler pool has been transformed into a highly interactive water play area for children of all age and ability groups. 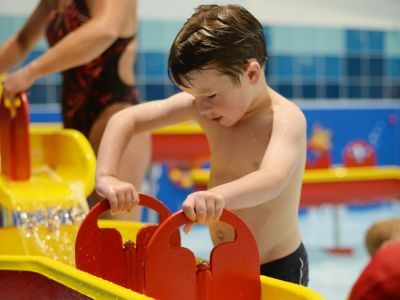 A wide range of water play features has been provided, aimed at increasing water confidence in toddlers and young children, using a unique combination of high and low-level water play features. The bright and colourful design captures the imaginations of young minds while providing learning through play scenarios. A bright and colourful waterball is the centrepiece for the water factory. 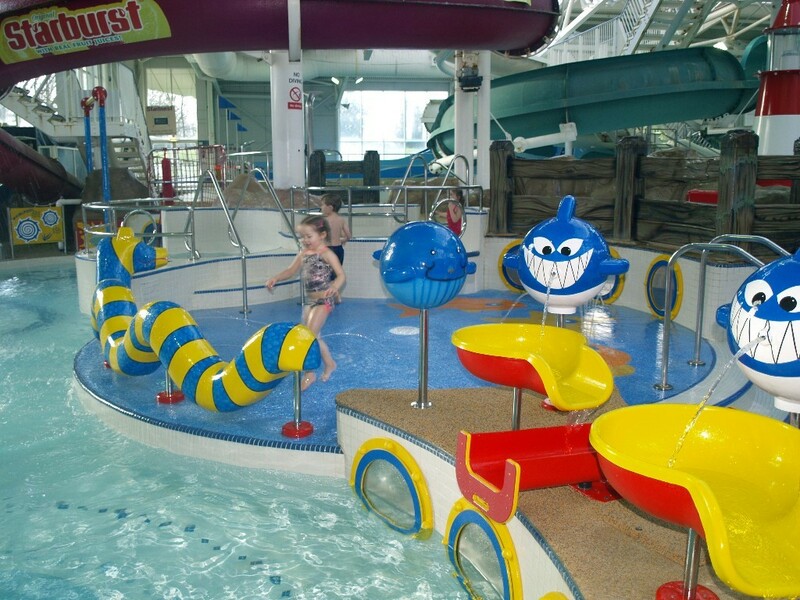 It is topped with a mast housing a variety of interactive features - a waterwheel, a shark shower and a tipping bucket which will splash children playing below at varying time intervals. The waterball is joined by a span pipe to a further mast located on the poolside which provides the water supply for the waterball features. The span pipe has two waterwheels and four small tipping buckets which all create extra anticipatory fun. The span pipe is also home to a pelican water squirt. jets. Toddlers have fun emptying the water from the fill ‘n’ spill buckets into the pool once they have been filled up by the water jets. They also enjoy controlling the flow of the water to the eight waterball jets by turning the handwheels. 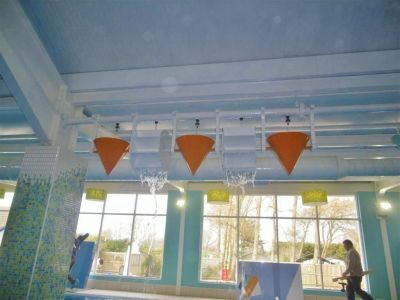 One of the waterball’s cannon jets provides the water for three interactive water channels of varying levels which cascade water into the pool. The water that flows into the channels can be manipulated by children as then turn the paddles. Further excitement is provided by a set of three interactive masts located on the poolside and joined together with two span pipes. 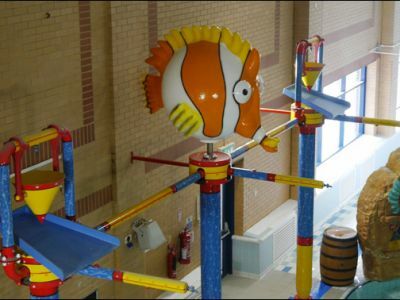 The centre mast is topped with a colourful giant fish which squirts jets of water at children in the pool. The other two masts feature large tipping buckets with splash boards which soak children standing below at surprise intervals. Finally, the tiles surrounding the pool have been replaced with a non-slip wet pour flooring which has be laid from the entrance to the changing room and around the beach area. Hippo also removed the existing falling rapids slide and refurbished some artificial rocks around the pool. Traffic light sensors and an LED display sign timing system have been installed on the flumes to improve safety and control access. The timing system allows riders to race in several categories which they can choose by pushing a button at the start of the ride! After six weeks of refurbishment work which started at the beginning of June 2018, the leisure pool was opened just in time for the summer holidays. 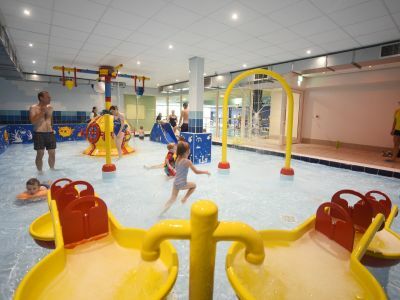 Neil Williams Sports and Service Manager at Places Leisure commented on the Places Leisure website: “Initial feedback has been positive, with the new interactive features being a big hit with families and young children”. 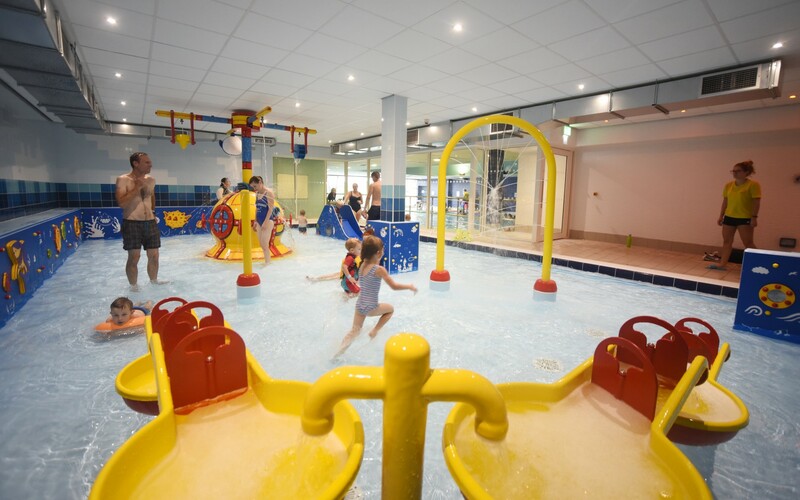 Tom Carter, Contracts Manager for Places Leisure commented on the Places Leisure website: “We want to thank all our customers, members and swim lesson participants for their patience during these works. It was a hugely important project for us to update the 19-year-old facility and give it a new lease of life. We want The Triangle to remain at the forefront of leisure activities and offer our customers the best experience when they come to the centre, the recent works will ensure we can do that”. The new features are designed to increase the level of interactive water play within the pool, excite and develop young minds and increase water confidence. the children to control the flow of water to eight of the waterball jets. Finally, two cannon jets create a gentle flow of water into the pool which children can manipulate by covering up the jets or part of them with their hands. The waterball is very easy to maintain as it houses a manifold and control system which is accessed via a removable panel on the side of the waterball. The top section of the existing pirate ship themed wall which houses two water cannons has also been refurbished by Hippo Leisure to enhance its visual appeal to children and even adults! The Leisure Pool has plenty of scope for additional Hippo Leisure water play features to be added in the future to keep it fresh and attractive to children. There is also potential to expand the waterball in the future by adding additional arms and/or joining it to further Interactive Masts. 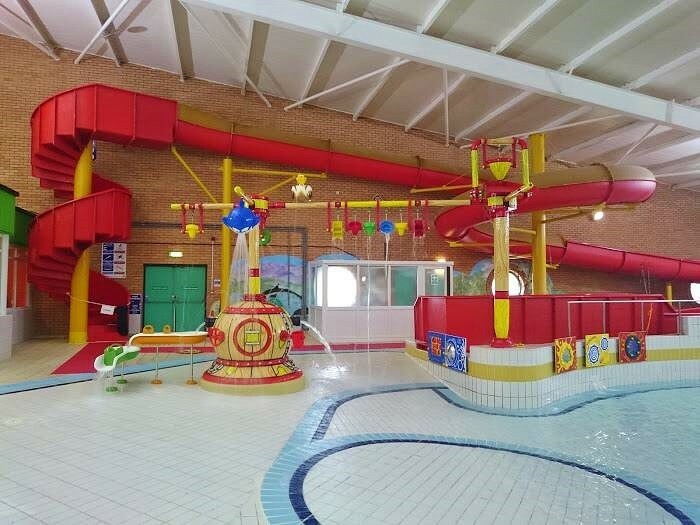 Hippo Leisure has installed a water factory in the toddler pool at The Grand Central Leisure Complex in Stockport as well as repairing and reinstating the two existing flume slides. The Hippo project is just one part of a £2.8m investment programme to improve the facilities. 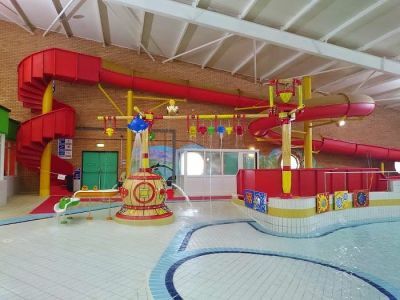 The new play features and refurbished flumes increase the kid appeal at the complex and will help it to increase visitor numbers and revenue for many years to come. 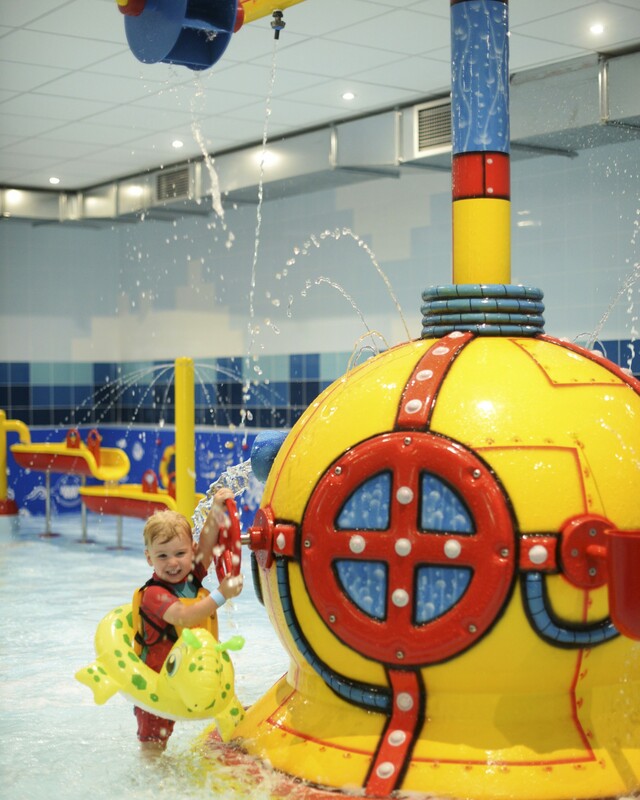 A bright and colourful waterball is the main focal point of the water factory themed play area. The lower part of the waterball excites toddlers as they have fun controlling the water jetting out of the waterball by covering up the water jet holes. The jets also fill up two fill ‘n’spill buckets which toddlers then tip to empty the water back into the pool. One of two cannon jets gushes water into an interactive water channel which cascades into a second channel before going into the pool. Children will enjoy turning the paddles on the channels to direct the water flow. The waterball has a mast which houses a variety of high level anticipatory features. More water confident children enjoy being sprayed by a waterwheel, showered with water by a shark and being splashed by a tipping bucket at surprise intervals. A span pipe which joins the mast to a short mast located on poolside also holds two waterwheels and four small tipping buckets for further high-level fun. Four bright and vibrant fish squirts in assorted designs sit on the raised section of the poolside and squirt water onto children playing in the pool below. Four colourful, aquatic themed interactive wall panels create a poolside barrier. They encourage children to increase their water confidence through learning and play. Each panel features a bright underwater design with series of moving parts and mirrors providing tactile, visual and auditory stimulation. A series of water jets are also features in the wall panels. 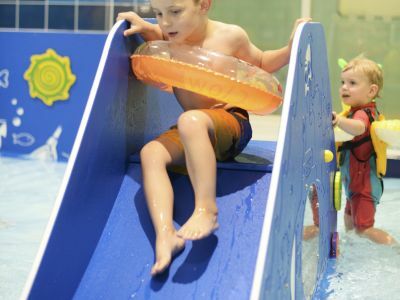 Finally, toddlers enjoy sliding down the under the sea themed toddler slide and splashing into the pool. The toddler slide features an aquatic design with mirrors and moving fish which brings far more excitement that a standard toddler slide! 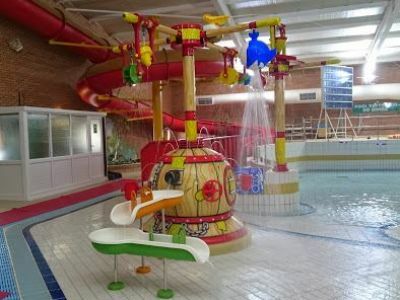 Hippo has recently installed a range of high and low level water play features at Haven Holiday Park, Burnham-on-Sea. 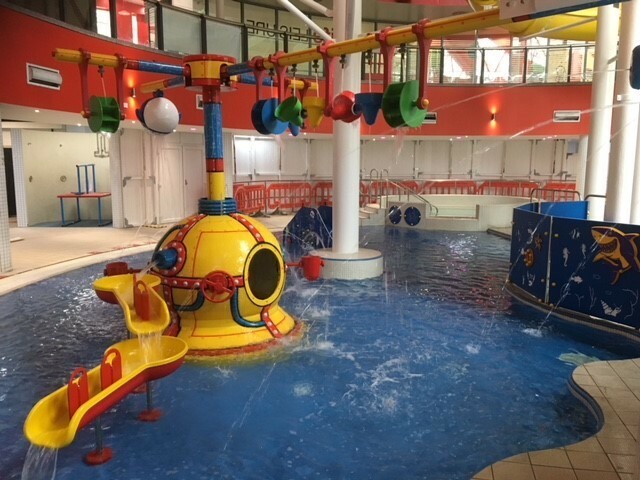 The indoor teaching pool has been transformed into a highly interactive, fun and exciting water play area aimed at increasing water confidence. A short mast supplies 2 interactive water channels with a flow of water which toddlers will enjoy manipulating through the channels and back into the pool. 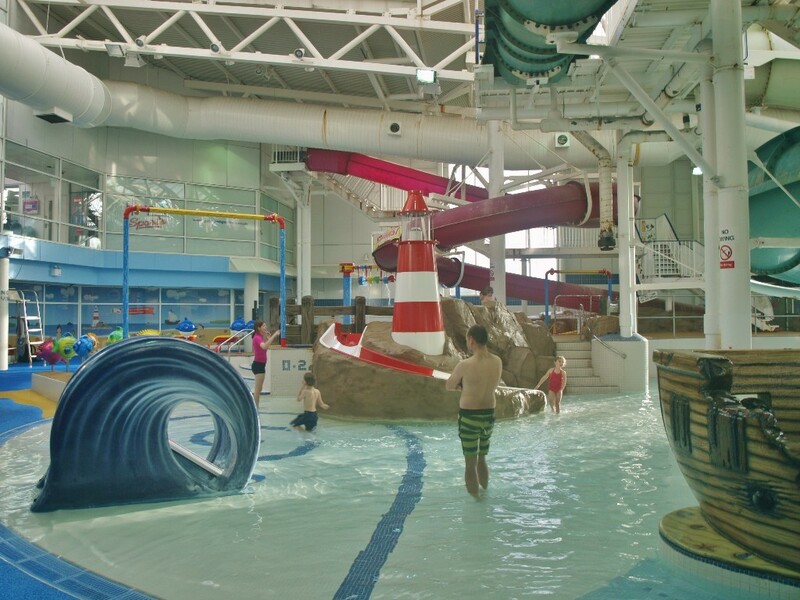 Older children will love the surprise and anticipatory element of the large tipping buckets, water wheels and shark showers which are suspended above the pool on a span pipe. High level water spraying, tipping and showering at regular intervals will create a big splash of excitement amongst the whole family. Hippo has converted the toddler and children’s pool at Guildford Spectrum Leisure Centre into an exciting interactive splash pool. It is aimed at introducing toddlers and the under 6s to a water play and learning experience that they can enjoy with their parents. Interactive play features have been installed to entertain and increase water confidence in a wide range of ages and abilities. An interactive arch which features include a waterball and a mast which can house up to 4 arms will provide endless low level fun for those that are new to water play. It will develop their water confidence by tipping water from filled buckets into the pool, turning hand wheels to control water flow and being gently sprayed by water streamers and water jets. There is a second water arch featuring a range of high level surprise and anticipatory fun including tipping buckets, water wheels and shark showers which will soak the children playing beneath them and are ideal for slightly older children that want wish to take their water confidence to higher levels. A mini splash pad is a big hit with all ages and features 3 in-ground jets which will soak children as they manipulate the water flow. There are also a series of mirrored portholes where children can watch their own reflection and a snake squirt that has a wiggly body and gently sprays water into the pool whilst also forming a barrier between the splash pad and the pool. An old whale feature was removed from a plinth within the pool and replaced with a selection of large and small fish squirts which are all bright, vibrant and visually appealing to children of all ages. A raised finger spray planter was also rejuvenated by replacing existing rocks with 2 shark squirts which fill a number of cascading channels which then cascade the water back into the pool. 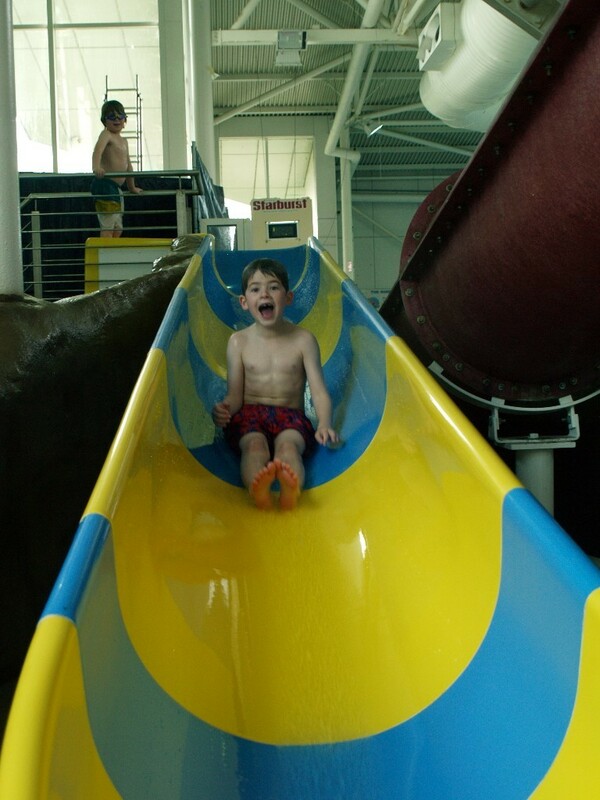 Children love sliding down the mini flume and splashing into the plunge pool. Toddlers and those that are less water confident have fun developing their learning with a series of interactive play panels which provide a barrier between the plunge pool and poolside. The panels feature mirrors and bubbles and encourage tactile, visual and auditory stimulation in toddlers and young children. The centre piece of the development is a colourful GRP lighthouse which features an acrylic window and an LED beacon for added visual impact. The light turns on when the wave machine is in operation. The lighthouse has replaced an old tree house feature and is clad in artificial rocks for realistic aquatic theming. 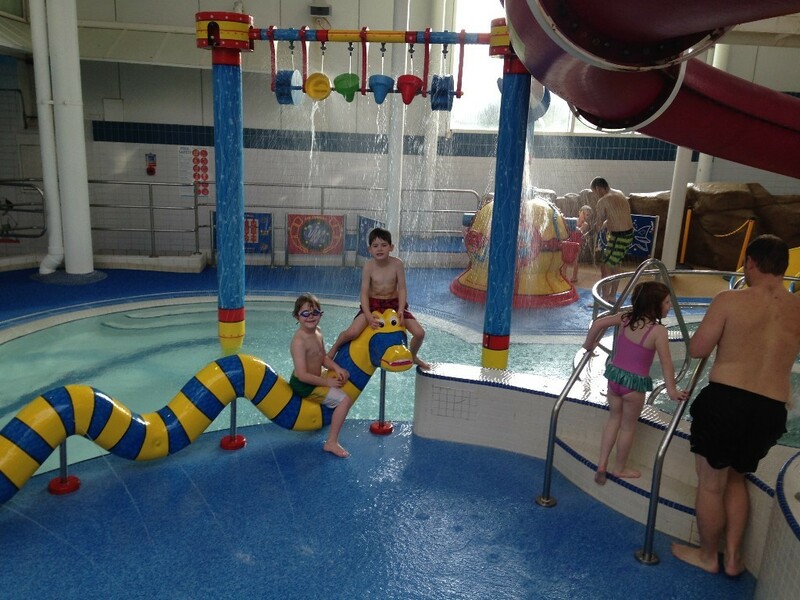 Tiny tots will enjoy sliding down a toddler slide which snakes around the lighthouse and ends in the pool. 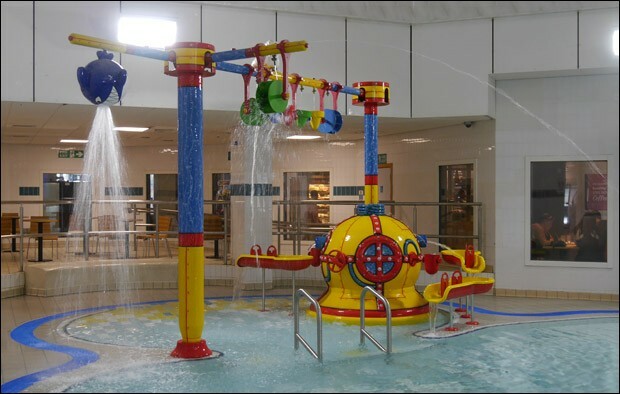 The play feature project was one of several undertaken at Guildford Spectrum in recent years and has been designed to facilitate future expansion when required. The installation is mindful of other leisure activities around the development being careful not to cause disruption to other activities taking place. The wet play installation was completed just before Christmas 2014 and from January to July 2015, visitor numbers increased by more than 100 per cent compared to the same period in 2014. Hippo Leisure transformed the leisure pool at The Park Leisure Centre into a Pirate themed interactive water play area to appeal to children of all ages and abilities. 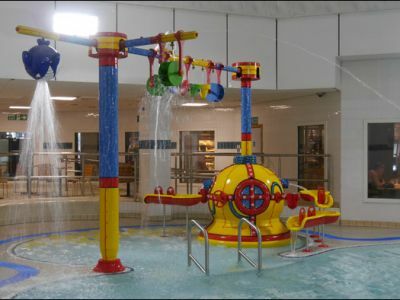 The play area comprises a water factory as well as a variety of toddler splash toys. The water factory centre piece is a bright and colourful Waterball which includes a range of low level play features for toddlers including fill and spill buckets, handwheels and cannon jets. 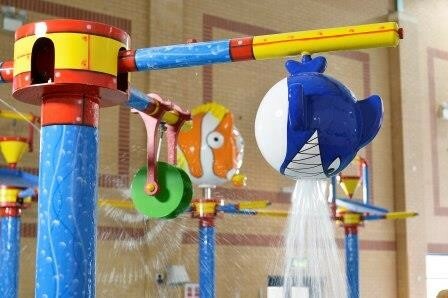 The Waterball has 4 arms which provide anticipatory play for older children in the form of a shark shower, small tipping bucket and waterwheel. Further excitement is created by an arch with a pelican themed squirt, more tipping buckets and small water wheels, enabling water to be squirted, tipped and sprayed onto children below. A second mast joins onto the opposite side of the arch and provides big splash play with a large tipping bucket and splash board. Once the bucket is filled by a water jet, it tips, splashing water onto the splashboard, drenching those children playing below. 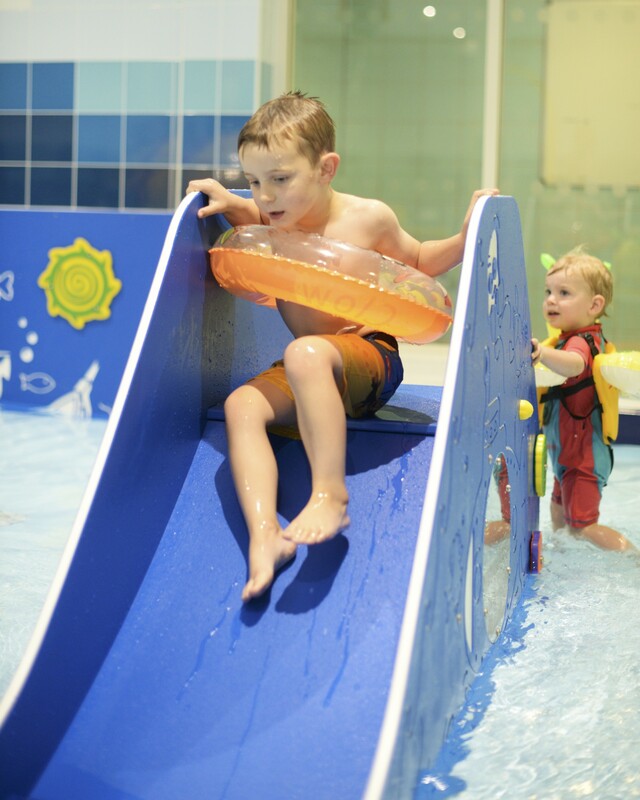 Splash Toys encourage toddlers and less water confident children to join in the fun and include interactive channels and a selection of play panels. 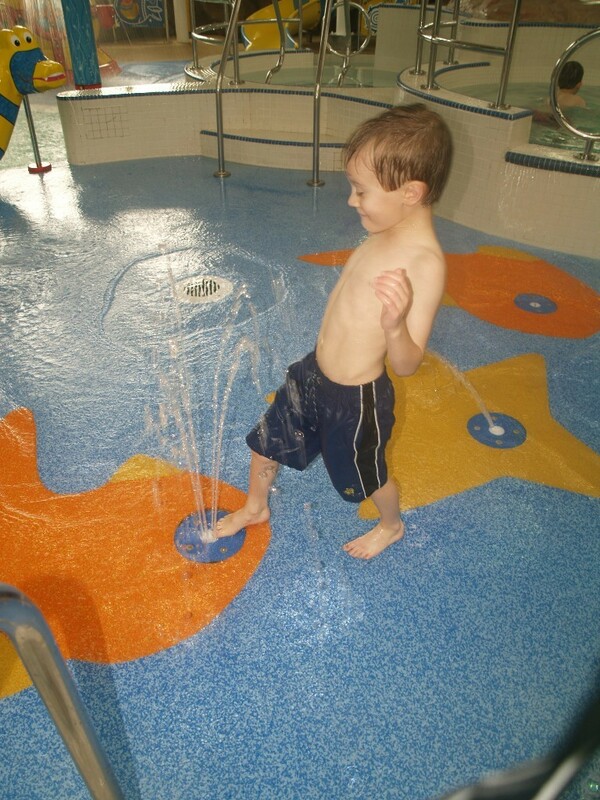 The interactive channels feature paddles which allow children to direct the flow of cascading water through the channels and back into the pool. Bright and colourful aquatic themed play panels will promote learning through play by providing visual, mental and auditory stimulation. The panel themes include treasure island, hidden treasure, swim challenge, sea serpent and whirlpool. A splash mirror panel providing light reflection, image and movement reflection adds to the interactive fun while a who pairs wins panel will bring out the competitive side of children.